Beat the March Madness Advising Rush! 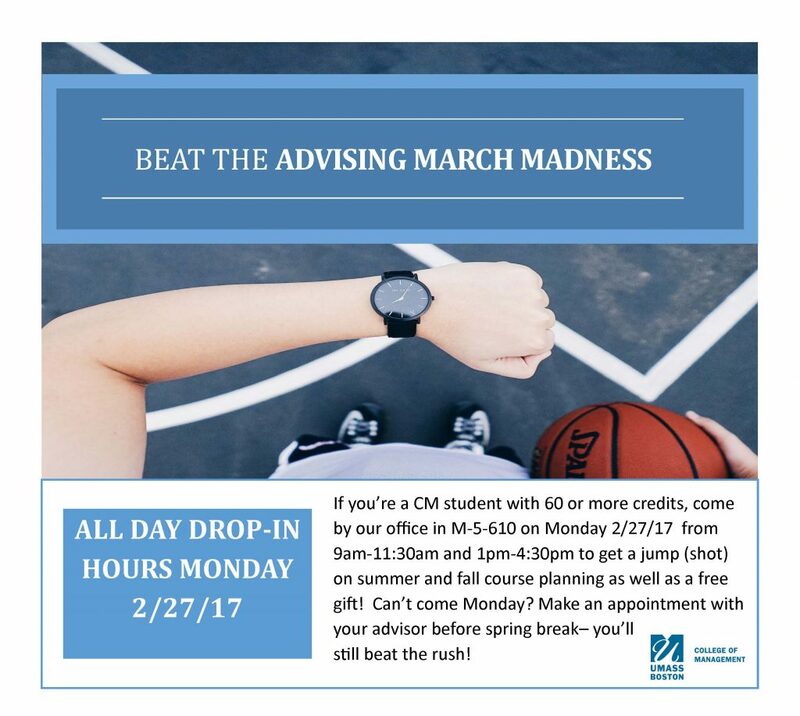 Come by our office TODAY between 9am-11:30am and 1pm-4:30pm for all day drop-ins to get a jump (shot) on your summer and fall advising! You’ll get a FREE GIFT for coming by so early! If that doesn’t work for you, check out your advisor’s calendar to schedule an appointment before spring break- you’ll still beat the rush. Here are the MAP Workshops for the week of 2/27/17. Unfortunately, we do not have any MAP Workshops offered on this day, please check another day for more great opportunities! For updates + locations, please log into the MAP Student Portal. Beat the March Madness Advising Rush! Come by our office on 2/27/17 between 9am-11:30am and 1pm-4:30pm for all day drop-ins to get a jump (shot) on your summer and fall advising! You’ll get a FREE GIFT for coming by so early! If that doesn’t work for you, check out your advisor’s calendar to schedule an appointment before spring break- you’ll still beat the rush. 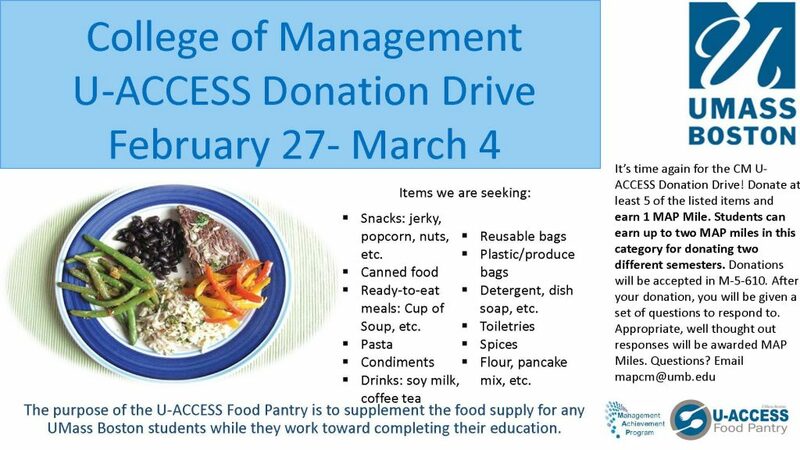 It’s also time again for the CM U-ACCESS Donation Drive! Donate at least 5 of the listed items and earn 1 MAP Mile. Students can earn up to two MAP miles in this category for donating two different semesters. Donations will be accepted in M-5-610 between 2/27/17 and 3/3/17. After your donation, you will be given a set of questions to respond to about corporate social responsibility. Appropriate, well thought out responses will be awarded MAP Miles. Questions? Email mapcm@umb.edu. Also- don’t forget about MAP-eligible mock interviews with Mary Thistle! You have a unique opportunity to earn a MAP mile by participating in a mock interview with Mary Thistle, Chief Operating Officer at Dimension Therapeutics and member of the CM Deans Advisory Board. A mock interview is an opportunity for you to practice your interviewing skills with a professional business person who will provide you with feedback on how you can improve your performance in real interviews. Come prepared as if this was a real interview and Ms. Thistle will be able to offer feedback to help you prepare to be your best! You are required to bring a resume and a job description to which you are applying. Ms. Thistle will be available all day on 3/2/2017 to see students. Please use this link to sign up for an interview slot. Please email mapcm@umb.edu with any questions about this or if you need to make any changes to your interview time. The interview location is in Career Services and Internships in the Campus Center, Room 1315. Each mock interview will be worth one MAP mile. Students are limited to one mock interview. Please see below for next week’s MAP opportunities and keep reading if you’d like to earn a MAP mile by engaging in a mock interview with a CM Advisory Board member. You also have a unique opportunity to earn a MAP mile by participating in a mock interview with Mary Thistle, Chief Operating Officer at Dimension Therapeutics and member of the CM Deans Advisory Board. A mock interview is an opportunity for you to practice your interviewing skills with a professional business person who will provide you with feedback on how you can improve your performance in real interviews. Come prepared as if this was a real interview and Ms. Thistle will be able to offer feedback to help you prepare to be your best! You are required to bring a resume and a job description to which you are applying. Ms. Thistle will be available all day on 3/2/2017 to see students. Please use this link to sign up for an interview slot. Please email mapcm@umb.edu with any questions about this or if you need to make any changes to your interview time. Please prepare for this mock interview as if it was a real interview and bring a current resume and job description to which you are applying. The interview location is in Career Services and Internships in the Campus Center, Room 1315. Each mock interview will be worth one MAP mile. Students are limited to one mock interview. Feel free to let me know if you have any questions by emailing mapcm@umb.edu. Comments Off on Thinking about Studying Abroad? 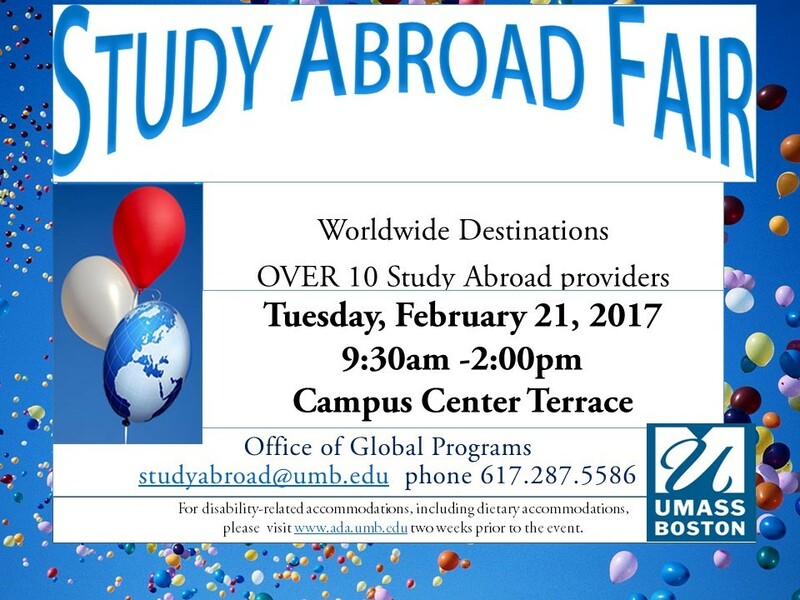 Don’t miss the Study Abroad Fair!! Comments Off on GRADUATION QUICK CHECKS! Stop by one of our Graduation Quick Checks to make sure you are on track for graduation in May 2017 or August 2017. Please see below for the MAP Events for the week of February 13, 2017. Please log into the MAP Portal for locations and any updates to these events. Have a great weekend! StrengthsQuest is an assessment that will help you to develop and apply your talents for academic, personal, and career success. Take the StrengthsQuest assessment and learn what makes you stand out! As CM students, you have a special opportunity to take the StrengthsQuest assessment and discuss your results. In order to take the assessment, you must attend the workshop on 2.13.2017 from 3pm-4:30pm. RSVP in the MAP portal by 2.10.2017 at 11pm in order to receive a code to take the assessment. You must take the assessment before the workshop on Monday 2.13.2017. RSVP here and email mapcm@umb.edu with questions. There are three scholarship opportunities for College of Management students currently accepting applications. Applications must be completed by 11:59 pm on Friday, February 17th, 2017. Late applications will not be considered. To read more about these scholarships, please go to: https://www.umb.edu/admissions/scholarships/continuing_students. We strongly encourage you to submit an application by the deadline if you think you meet the scholarship criteria for these scholarships! StrengthsQuest is an assessment that will help you to develop and apply your talents for academic, personal, and career success. Take the StrengthsQuest assessment and learn what makes you stand out! As CM students, you have a special opportunity to take the StrengthsQuest assessment and discuss your results. In order to take the assessment, you must attend the workshop on 2.13.2017 from 3pm-4:30pm. RSVP in the MAP portal by 2.10.2017 at 11am in order to receive a code to take the assessment. You must take the assessment before the workshop on Monday 2.13.2017. RSVP here and email mapcm@umb.edu with questions.